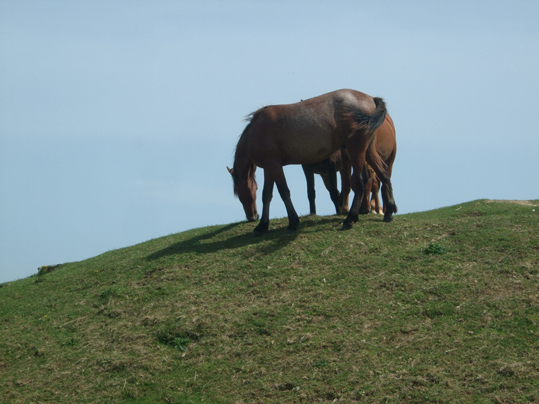 A bad witch's blog: Holiday Memories: Did I See Sleipnir on a Sussex Hill? Holiday Memories: Did I See Sleipnir on a Sussex Hill? As I mentioned yesterday, I'm on holiday this week and probably won't have much internet access. Not wanting my blog to be devoid of posts while I'm away, I decided to look back at some of the photos I've taken in summers past and share a few of the best that never made it to my blog until now. I took this photo at the top of Cissbury Ring, in Sussex, last summer. At first glance it looked like a horse with eight legs and I took a double-take before getting out my camera. But no, it wasn't Sleipnir, just two horses close to each other creating an optical illusion.